Is This The Best Snow Blower For You? Craftsman is offers a snow blower for every homeowner; from “good” models that are the least expensive on the market to a “premium” model that is larger than you tractor mounted snow thrower. This premium 28 inch snow blower (Craftsman 88395) has all the features you want like power steering and 4-way chute and will easily handle 12 inches or more snow on a 3 car drive 100 feet long. What makes this snow blower premium? Tool-less drift cutters, These are easily stowed so your snow blower doesn’t take up so much room when parked in your garage. Poly skid shoes that don’t mark your new patio or stained driveway yet are as tough as the steel shoes on other brands. Single handed 4-way chute control. The extended chute puts the snow where you want it and it so strong it has been driven over by a pickup and still bounces back to it’s original shape. The efficient Overhead Valve motor with electric start is sized to get you job done quickly and efficiently. Power Steering. The trigger controlled steering gives you full traction when you need it, yet is so easy to use even your “grandmother” can use it. New HID LED light. This new light gives you the illumination you need to move snow all night long. This snow blower by Craftsman is a premium snow thrower at a “value” price. If you follow Craftsman you know this size has been missing from the line-up for a few years now. With this new snow blower Craftsman has put all the features you asked for, yet they have kept the cost less than other brands. What you can use this snow blower for: For paved and gravel surfaces, patios, sidewalks and walkways. All types of snow including heavy, wet blizzard snow. Because it has larger tires than most of the other snow throwers you can go out in the back yard and easily clean a spot off for your dogs or make a path out to the chicken coop. You can use this to clean your patio and deck and the poly skid shoes will not scratch the surface. This is the right snow blower if you have a stained concrete drive. This snow blower will easily handle 12 inch and deeper snow falls. The six forward and two reverse speeds will let you go slow for the heavy stuff and faster for the lighter snows. What you may not like: This snow blower is 28 inches wide and will probably fit through the side door of your garage. If you have to go through that side door to move snow make sure the door is at least 31 inches wide. Owners of the 4-way chute control on this unit eight love it…..or hate it. What most owners don’t understand is the control is actually designed to use your hand to release the chute and your forearm to move it from side to side. This works very well because you use the strength of your forearm to change the rotation of the chute but it does take some getting used to. Note! If the item is in stock at your local Sears you can order it here and within 30 minutes pick it up. If the item is not stocked you can order it here and it will get to the store in about 5 days. You can have it delivered or pick it up! Be Careful! This snow blower is sold through Sears and Sears Hometown Stores ONLY! You may find other “factory-direct discount” stores and websites trying to sell it, but make sure they are authorized Sears sales representatives. Is This One Of The Best Rated Snow Blowers for 2012 – 2013? This snow thrower is new. It has not been rated yet. That said, the drive system has been around for many years and is one of the most dependable around. The transmission is proven reliable on this size. The impeller, auger gearbox and shear pin system has proven itself over the years. Does This Get a Best Snow Blower Rating For 2012-2013? In the Good, Better, Best rating system this snow blower rates a “Best” for ease of use, durability and long life. Power Steering, 4-Way remote chute, electric start, large engine all factor into this “best” rating. It uses a strong Craftsman motor that has plenty of power for it’s 28 inch size. In fact the motor is one of the most dependable on the market today. Don’t be afraid to buy this snow blower if it fits your needs. Is This One Of The Best Snow Blowers for the Money 2012-2013? I normally don’t give you my opinion, but I do expect owners to like this machine. It is a great value for the size, has plenty of power to handle any snow, and “creature features” like the power steering and 4-way chute that makes this one easy to use. Value: At around $999 it is a good value. Watch for special “Shop Your Way Rewards” sales, no interest or cash back with a Sears Card, Family & Friends, and Midnight Madness Sales. Service & Parts Availability: With this snow blower you have the choice of calling 1-800-4MY-Home and have a tech come out and fix it OR take it to your local Sears and they will have it serviced for you. With a protection plan either way is no-charge to you. Ease Of Use: This is a very easy snow blower to use because it has power steering and the 4-way chute. It doesn’t matter if you are 5 ft, 100 lbs or 6 ft, 350 lbs you will be able to easily operate this snow blower. Yes, you can buy this one for your wife and she will be able to use it. The power steering makes it a breeze to use. It is balanced well so you if you do have to lift up the front to go over an obstruction you easily can do it. Under normal snow removal conditions you will appreciate the traction this unit has. The extended chute allows you to put the snow exactly where you want it. Other features like good knobby tires, a headlight and electric start make this snow blower a much better choice for most people than the economy models. 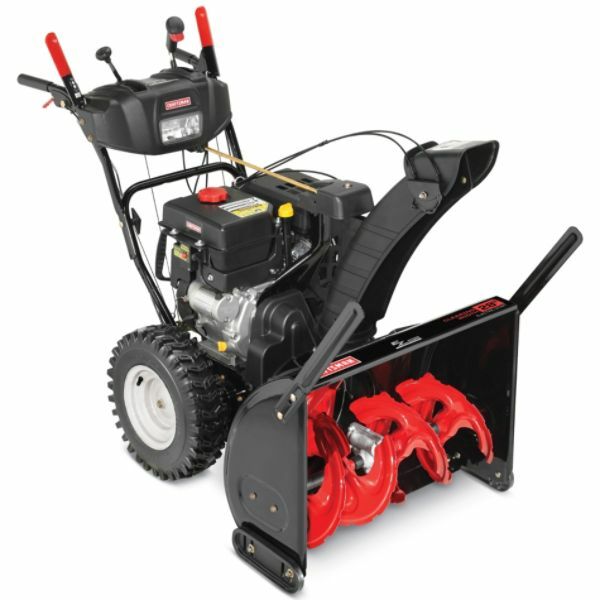 Move more snow with a more powerful engine and save time out in the cold. This 28 in. Craftsman® Dual-Stage Snowblower has a 277cc* 4-cycle OHV engine, EZ Steer for better maneuverability and 4-way chute control. * As rated by engine manufacturer.